The energy, the strength and the generosity of our grassroots team never ceases to amaze me. 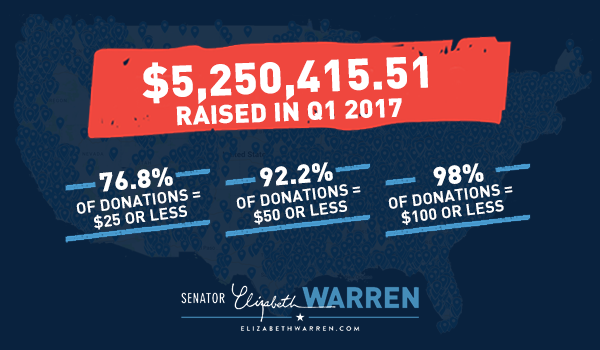 We just finished tallying the numbers for the first fundraising quarter of our re-election campaign, and holy guacamole: We raised $5.2 million – the most announced by any Senate campaign. But it’s how we raised that money that’s really important to me. We didn’t run to Wall Street or Big Oil or any of the other powerful interests – we did it with thousands of people across Massachusetts and around the country chipping in $5 or $10 at a time. In fact, nearly 16,000 people donated to our campaign just in Massachusetts. Asking for money is the very least favorite part of my job as a United States Senator. I’d rather have Donald Trump give me a root canal. I hate it because I know times are still tough for a lot of people out there – young people crushed by student loan debt, parents trying to pay for childcare, and seniors trying to scrape by on Social Security. But I also know that we’re a team – and the contributions of this grassroots community send a powerful message to Donald Trump, Mitch McConnell, the Koch Brothers, and the powerful interests that we’re not going to roll over and give up while they rig the system for the billionaires and bankers. Your support – and the support of thousands more like you – is making a real difference in this fight. We couldn’t do it without you.